Olem has been a guest guitarist in 2016 and 2017 for the Eugene Concert Choir. In 2016 he was honored to be a part of the Burt Bacharach Songbook performance in the Silva Concert Hall at the Hult Center in Eugene Or. and then again in 2017 with the Eugene Concert Choir in a performance of Tin Pan Alley classics from the beginning of the 20th century. 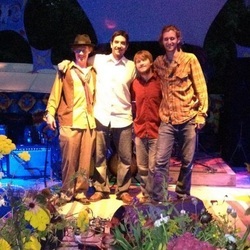 This guitar, bass and drum jazz trio (Olem on Guitar, Tyler Abbot on bass and Ryan Biezac on drums) is a perfect group for occasions big and small ranging from intimate cocktail parties to large corporate events. Their versatile and expressive approach to jazz lends itself to being a part of the mood to a party and staying in the background or performing as the main attraction to the event. They perform many styles of jazz including swing, bossa nova, blues, funky jazz and a nice ballad to fit the moment. You might see traditional standards such as Night and Day, Autumn Leaves, Summertime and others. They have recently finished their first album entitled "Standards." They also break into solo and duo formats to fit any occasion. Inner Limits is a Eugene based jazz/fusion funk band with Olem Alves on guitar/vocals, Eli Copeland on electric bass, Torrey Newhart on electric keyboard, and Adam Carlson on drums. Inner Limits has three albums on the market and is currently working on their fourth with it’s new lineup. Lead by guitarist Olem Alves, the group plays a mixture of groovin' originals and funky jazz tunes, which are designed to light the funk in your soul and lure you to do dance floor with their entrancing beats and extended improvisations. Inner limits plays venues big and small and might be seen playing at smaller venues like Sam Bonds Garage on a Friday night or a large music festival like the Black Sheep festival on a Saturday night. 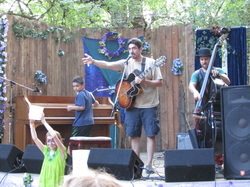 Inner Limits has played music festivals like the Oregon Country Fair main stage (2010), Black Sheep festival (2012), Tayberry Jam (2012) and others. They have also recently rocked local Eugene clubs such as WOW Hall and Luckey’s music club. - DJ Kim Buchanan, KWVA Radio, Eugene, Oregon. 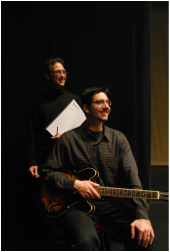 The Concerto for Electric Guitar and Chamber Orchestra was written by local Eugene Composer Paul Safar for Eugene guitarist Olem Alves. Alves performed this with an orchestra assembled from the Eugene Symphony, the Oregon Mozart Players and the University of Oregon School of Music and Dance, conducted by Douglas Detrick. 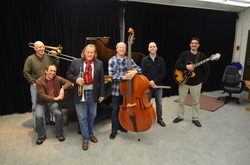 The LCC faculty jazz ensemble is comprised of some of the Northwest’s finest players headed by jazz director Ron Bertucci on Trombone, Dave Bender on trumpet, Olem Alves on guitar, Nate Waddell on Bass, Matt Svaboda on piano and Randy Rolfson on drums. They perform locally for both public and private events at clinics and jazz clubs. Their annual spring concert at the Ragozzino Performance Hall at LCC is something jazz fans won’t want to miss. Young talent on piano tearing it up with their dad.